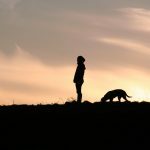 Home » For Pet Lovers » Are We Failing Dogs? Do we owe dogs anything other than a roof over their heads and meals? One species out of all the others decided to live alongside us. Are we doing them justice? Based on my 20 plus years of working with dogs, I contend that we are failing dogs in many ways. We fail dogs in many of the same ways we fail ourselves: we are in too big of a hurry. We want it all, and we want it now. We are so focused on acquisitions (knowledge, house, car, status) that we have no time left for feeling gratitude for what we do have. We are a nation full of suffering souls. Some suffer for lack of social standing while others go hungry every day. Many of us are in pain from a lack of true connection with our fellow man. And who do we turn to at the end of the day to ease our suffering? For millions of us, we turn to our dogs. Most people in the United States suffer from a nature deficit. So do our dogs. Too many dogs spend their entire lives inside the walls of their humans’ homes, only going out to relieve themselves. We’re wasting our dogs’ incredible minds. Many dogs live pathetically boring lives. Do people as well? We want dogs to be quiet. Don’t chew on things, don’t jump up to say hi, don’t run in the house, don’t play too roughly with our under-supervised children. We ask a dog to join our family, and we expect him to love every human, except when there is a bad person trying to hurt us—then it’s OK for the dog to bite, and we expect the dog to know the difference. We demand that our dogs love all other dogs, even though we don’t bother training them how to nicely greet one another, and we don’t adequately expose them to safe dogs during the critical puppy socialization period. We permit puppy mills and backyard breeders to keep stressed-out mother dogs alive just to breed again so they can make some cash off of their offspring. We purchase breeds that become popular or dogs that fit into the “designer” category. Breeds such as German Shepherds, Labrador Retrievers, and Golden Retrievers become popular for good reasons, and then we make them physically or mentally unsound with rampant breeding and no requirements for good health and solid temperament. We spend a great deal of our time telling our dogs “no” and “don’t.” We put huge expectations on another species, and many times these marvelous creatures step up and deliver, often at great costs to themselves. A dog cannot win for losing. Do you know what your dog wants? Do we even care what any dog wants? We tell ourselves that dogs are here to serve us, and that negates any needs or desires that they have. We once pointed to dogs as beings that we wished we could be more like: a species that lives in the present, and one that seems to love unconditionally. After a lifetime of serious study of this amazingly talented and kind animal, I can tell you many of the things that dogs do want from their lives. A dog wants a connection (same as you do). We breed dogs to want to be around us. They love to look at our faces and eyes and are extraordinary readers of human behavior. It’s cruel to take a social animal and shut him away in a crate for most of the day or let him languish in an empty backyard or imprison him at the end of a chain. Dogs serve as a bridge. I like people who like dogs in the same way I do, even if I disagree with their politics or religion, and even if they disagree with mine. A dog wants to seek. Dogs seek first through their noses and then with their mouths and tongues. To live is to seek. When we pull and tug on a dog during his short outside time on a walk, we are depriving him of seeking. No, the dog does not need to yank your arm off. You can allow a dog to sniff and seek while keeping your arm in its joint with good, positive reinforcement training. A healthy dog enjoys play. Do you allow yourself to play? No? And you wonder why you feel frustrated? Dogs ask us questions with their bodies because they can’t talk to us in human language. They ask us what we ask of ourselves: how can I obtain pleasure and how can I avoid pain or fear? When we get a dog, we expect him to give us joy, but it is a one-sided relationship, one that puts enormous pressure on an animal with the mind of a two- to three-year-old child. Dogs want a sense of control over their bodies. How do we give dogs a sense of control over their environment? One way is to be predictable. Don’t giggle at your dog and pet him happily when he jumps up on you to say hello today and then get furious when he does it again tomorrow. Show your dog what to do instead of what not to do. We have to stop living in fear. The always-intriguing NPR podcast, Invisibilia, has a great show about fear. A scientist on the show says, “Modern life is constantly triggering fear in all kinds of ways that our natural war didn’t.” Another scientist notes that things such as mass shootings are no longer novel—they are daily events, constant occurrences. He adds, “Because of our wiring, we are not set up to ignore it, so it distorts our experience of the world, activating our fear when we don’t need [it].” Fear begets fear. Fear blocks love. Fear thwarts trust. Fear will wear you and those around you out, including your dog. Create more oxytocin for yourself and for your dog. Remember the study that told us that when we look into a dog’s eyes, the dog’s level of oxytocin—the “love hormone”—increases? It also increases on our side of the equation. If you can’t love the people in your office, or the politicians, or everyone who gets in your way as you fight to get to work on time, try creating love at home with a furry, friendly housemate that can’t annoy you the way other people can. If you can express only eye love (followed by heart and soul love) for a dog, I think that’s an excellent start. For some of us, that is the only love we will know in a lifetime. Love your dog, and, as you love him dearly, be a life guide and teach him how to live successfully among a rather aggressive species that his ancestors, for some unfathomable reason, nestled up to, proving that dogs are a very brave species. Aren’t dogs worth the effort? If we can’t reach out a hand and help ourselves very well, guess who we can help? He’s likely curled up somewhere near you as you are reading this. We have to change this—the dogs cannot. “Are We Failing Dogs” is modified for this space. Reprinted with permission from the publisher for the book, The Midnight Dog Walkers: Positive Training and Practical Advice for Living with a Reactive of Aggressive Dog (Lumina Media ISBN 978-1-62187-116-3) by Annie Phenix, CPDT-KA.